If you’re relishing ditching the lousy January weather of your headquarters for the Palm Springs, Calif., Collision Industry Conference, why not prolong your sunshine with some of the other CIC Week events? CIC runs 8 a.m. to 5 p.m. Jan. 18, 2018, with the reception the night before at 6:30 p.m. But don’t just blow in for the party Wednesday night. Get into town earlier, and you can attend the Society of Collision Repair Specialists’ 8:30-10 a.m. open board meeting Jan. 17, also at the Palm Springs Hilton. It’s the kickoff event for the trade group’s 2018 lineup. Anyone is welcome; SCRS membership isn’t required to attend. The meeting will include updates from SCRS Executive Director Aaron Schulenburg and SCRS committees “outlining current and future work initiatives each group has undertaken on behalf of the membership,” SCRS wrote in an news release. The highlight will be SCRS Education Committee Co-Chairmen Toby Chess and Kye Yeung’s annual presentation of “Kool Tools.” Chess and Yeung make the rounds at SEMA, collecting equipment they view as having high potential for a shop. 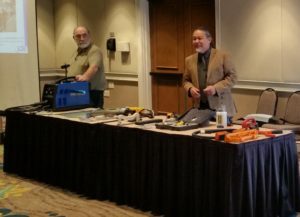 They pay out-of-pocket to avoid bias and test out the gear before presenting their favorites at the January SCRS meeting, giving attendees an advance look before repeating the presentation at CIC. “These highlighted tools often range from highly unique to ultra-affordable solutions that stand out as helpful in the collision repair process,” SCRS wrote in an news release. There’s other industry doings that week as well. Get into town even earlier and hit up the Collision Industry Electronic Commerce Association board meeting from 1-5 p.m. Jan. 16, 2018. The public is invited to part of the session; email Executive Director Fred Iantorno to reserve a seat. The National Auto Body Council will hold its annual golf outing Jan. 17, 2018, at 8:30 a.m. at the Tahquitz Creek Golf Resort. Stick around after CIC on Jan. 18, 2018 for the Collision Industry Foundation’s annual gala at Lulu’s California Bistro. The event runs 6-8 p.m.